Spreading the word about entomophagy (the eating of insects) is a fun and interesting challenge. Over the past years since the creation of Entomo Farms, we have introduced people all across the world to the delicious and nutritious world of edible insects. When we engage in our outreach, we always have food samples available. Oftentimes we will have some kind of baked good like a ginger cookie or a banana bread baked with the goodness of cricket powder, and we will always have small dishes of whole roasted crickets and/or mealworms available to sample as well. Sometimes people will come by our sampling table, eye me skeptically, and ask me, “well, do you eat it?” The answer is always, “Of course!” Here is just one way that cricket powder is used in our home, every day. We always have a bag of cricket powder in our fridge, and usually a bag of worms to snack on in our snack cupboard. 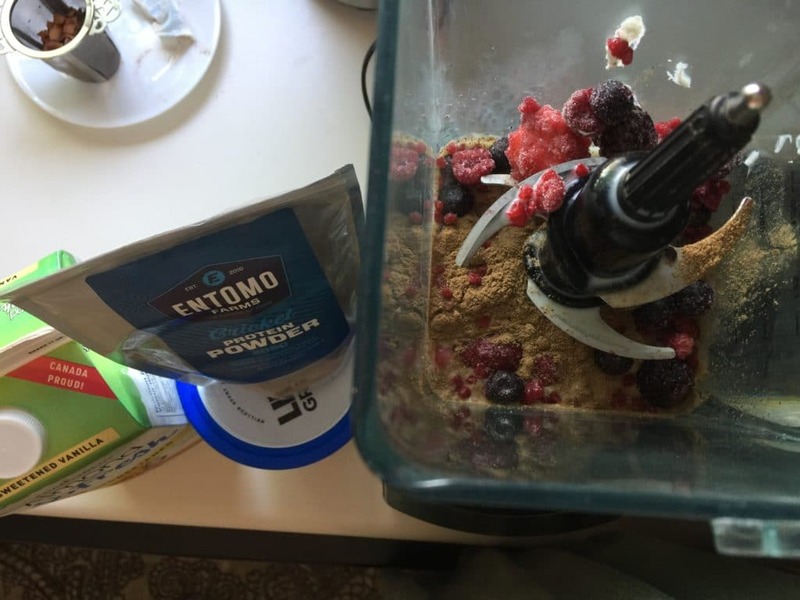 The President and co-founder of Entomo Farms, Jarrod Goldin, has a smoothie made with the goodness of cricket powder every day. Sometimes he has one to start his day off right, other days it is used as part of his post-workout recovery regime. 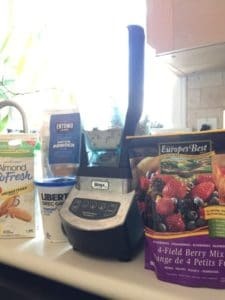 Whatever time, it always gives him the energy he is looking for to set his day off right, and to replenish the nutrients in his body. This smoothie is a blend of Cricket Powder, Unsweetened Almond Milk, Plain Unsweetened Greek Yogurt, and a Frozen Berry Blend. This entry was posted in Blog and tagged bugsendhunger, clean food, cricket flour, cricket powder, eat bugs, eat clean, eat crickets, eat healthy, eat insects, edible bugs, edible crickets, edible insects, Entomophagy, fit dad, fit mom, futureoffood, healthy food, Healthy snacks, kid snacks, smoothie, tastethenewnext.